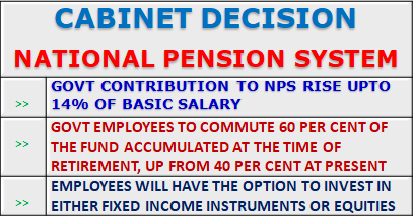 In a bonanza for government employees, the Cabinet Thursday raised the government’s contribution to National Pension Scheme (NPS) to 14 per cent of basic salary from the current 10 per cent, sources said. Minimum employee contribution will, however, remain at 10 per cent. The Cabinet also approved tax incentives under 80C of the Income Tax Act for employees’ contribution to the extent of 10 per cent, they added. 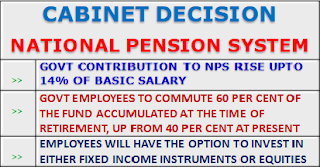 Presently, the government and employees contribute 10 per cent of basic salary each to NPS. While the minimum employee contribution remains at 10 per cent, the government contribution has been increased from 10 per cent to 14 per cent. The Cabinet, headed by Prime Minister Narendra Modi, also allowed government employees to commute 60 per cent of the fund accumulated at the time of retirement, up from 40 per cent at present. Also, employees will have the option to invest in either fixed income instruments or equities, sources said. The government did not announce the decision in view of the ensuing polls in Rajasthan Friday. While the government is yet to decide on the date of notification of the new scheme, sources said such changes usually come into effect from the beginning of a financing year, meaning April 1, 2019. This formula for changes in the NPS was worked out by the Finance Ministry based on the recommendation of a government-appointed committee.